At Stillpoint Yoga London we take great care with the teachers we invite to share yoga with our practitioners. When we organise workshops and events we see these as an extension of our own daily teaching. We feel that those we invite to lead them need to represent the spirit and values we hold at SYL, and that yoga is a practice of transformation and awakening. When we first met Kia Naddermier we knew instantly we had found a kindred spirit and a teacher of incredible depth and wisdom. We knew she would fit right in at SYL. We first heard of her through Le Yoga Shop magazine, which she runs with her husband Magnus. Like us, Kia facilitates a daily Ashtanga yoga self practice shala in Paris, which has become very popular. She is also a highly trained teacher of pranayama. In the past few years Kia has become a great friend to SYL, so we wanted to get to know her a little better and find out how she has come to the place she’s at now. We hope you enjoy the interview with her. Hey Kia, what was your life like before you practised yoga and what led you to take on the practice of yoga? Honestly, I can hardly remember as I have been practising for most of my adult life! But I remember very clearly my first encounter with the practice. It was in the mid-nineties, I was in my early twenties fresh out of photography school and had been sent off to London to report on the budding ‘alternative scene’ there. My then boyfriend had just returned from Mysore and directed me to John (Scott), who was teaching at City Yoga, a small yoga studio in east London. I had absolutely no idea what Ashtanga yoga was or who the teacher we were meeting was for that matter. The pictures later became the beginning of a book about yoga that was published in 2000. Would you share with us how Ashtanga yoga evolved in your life and the teachers who have influenced you the most? Since that first class, the practice has been the anchor of my daily life. It took me a while until I found a teacher back in Stockholm as Ashtanga hadn’t really reached that far north yet… Maria Boox was teaching in a small basement in Stockholm at the time, and I was over the moon when I finally found her! Later on she began inviting John to the Shala in Stockholm, and I also studied with him when I had periods of living & shooting in London. He was and still is a very important influence, teacher and friend who continues to inspire me in many ways. Very early on Magnus, my husband, and I also started going regularly to Radha in Crete and have continued to do so for almost 20 years. Our children Uma & Devi both learned to take their first steps in Crete and are now practising with us in Radha´s shala when we are there! Radha was of course one of John´s first teachers, together with Derek, so it felt very coherent. I have since then studied with many senior teachers of the Ashtanga Yoga lineage, as well as spent time at KPJAYI in Mysore. My teacher of pranayama and philosophy is Shri O.P Tiwariji. He has and is giving me more than words and I feel truly blessed to be guided by Tiwariji on my yoga path. The calling to dedicate myself to sharing this practice came during the darkest time in my life when my sister got ill and finally passed away. This experience altered my life completely. Many things that I had thought so important, the fashion business, my career… all seemed so small. So, when I was asked to teach Mysore it was not really a choice, it was the only thing that made sense. How did you balance the practice of motherhood, running a business and being a practitioner? I wish I could say that there is always harmony in my life and that I have a magic formula to make it all flow perfectly… But there is no way around it, my workload is heavy and requires a large amount of discipline, planning, work and dedication. What I do have, though, is my daily practice which is my sacred space. I find it a constant source of clarity and replenishment. One that helps me choose what is important over what is urgent (most of the time!) And all the things you mention: being a mother, photography, my yoga shala, practising, are all magical in their own way. I consider it a privilege to be able to spend my days doing what I love. But I think it´s important to remember that Patanjali never speaks of practice alone, but always in combination with non-attachment. Non-attachment also in regards to the practice itself is key for a healthy relationship with the practice. If not, the yoga practice will simply become yet another way to gratify or punish oneself, enhancing existing conditionings and patterns. Some days letting it go will actually be prioritising what is important over what seems urgent. In your workshops you emphasise Ashtanga yoga and pranayama practice being intrinsically linked and (as you said above) you are trained to teach pranayama by Shri O.P Tiwari, one of the few remaining masters of pranayama. Could you explain how you see the coming together of these two practices (Ashtanga yoga and pranayama)? I consider pranayama the most central part of my yoga practice. The physical asana practice leads up to it, and the inner more subtle aspects like concentration and meditation are natural results of it. The beauty of Patanjali´s 8 limbs is that they teach us to integrate all aspects of yoga. They are all interrelated and can be practised simultaneously, but they also map out a logical progression in which each limb prepares the practitioner for the next. I believe Guruji named his practice Ashtanga Yoga to remind us of the practice as a whole, that it is part of a larger context. The method of pranayama I have been taught by Tiwariji does not have a particular “style” or name. The practices are taught and practised simply according to the classical scriptures. Tiwariji always says: Nothing is me, nothing is mine. I completely resonate with the clarity and authenticity of his teachings and am truly humbled to be his student. Pranayama practices are (also in accordance with the scriptures) to be introduced very gently and gradually, tailored to the individual. This is how I practice and share it. 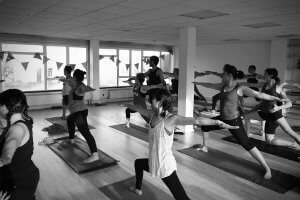 Like us at SYL in London you have run a long term daily Mysore programme in central Paris. How have you found the growth of this for you as a teacher and a practitioner? Many of our students are yoga teachers themselves and I also run an apprentice program, so there is naturally a constant flow of sharing and exploration in the room. To teach yoga is a never-ending learning process. Every student experience and journey is unique and as their teacher I´m invited to share it with them. This is an infinite source of inspiration and possibility to evolve. I see it truly as a privilege. If it’s okay I’d like to ask you something quite tender that I think has incredible value for seeing how a community can come together through trauma. Your shala in Paris was very close to the terrorist attacks that befell the city in November 2015. 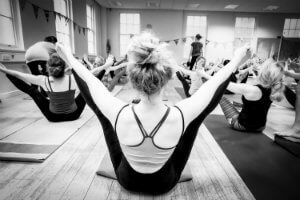 Would you share how that affected you personally, the Mysore Yoga Paris community and how you as a yoga community moved through that harrowing time? These events happened literally on our doorstep and we are all still very much in the aftermath, experiencing the effects on many levels. Personally I still find it very difficult to put words on it. The Monday after the attacks we decided to open the Shala for a meditation on peace and Ahimsa. We put out a simple invitation to join either in person or to “tune in” from wherever you are. 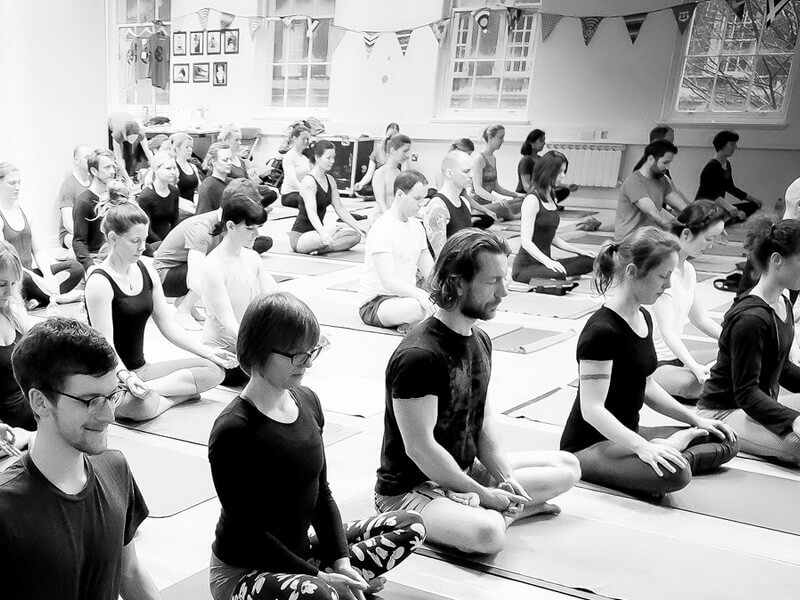 The support for the situation in Paris from the Ashtanga community worldwide was astonishing. We had messages pouring in to Mysore Yoga Paris from shalas on all continents – from Europe to the US, Australia, Africa, South America, Russia… All gathering their communities to sit with us at the very same hour. It was such a dark moment in Paris but we felt truly held by our community and the unifying message of yoga. Has it changed the way your community practices together? Yes it definitely has. It´s difficult to put my finger on it exactly, but the sense of community has deepened even more as we have unrolled our mats through thick and thin together. An enhanced gentleness between practitioners has evolved. I think we all have woken up to recognise how immensely fortunate we are that our life situation is such that we can begin our days practising yoga. There is a silent agreement not to take any of it for granted. Kia, thank you so much for your time. Is there anything you’d like to leave us with? I am so grateful to you Scott & Louise for inviting us so generously into your beautiful community at Stillpoint. Can´t wait to see you, share and explore more of this together very soon..!